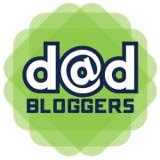 The Cowardly Lion has Found His Courage | Daddy's in Charge? It's been quite a while since we have seen a picture like this. For almost three years Carter has been deathly afraid of characters, this includes Santa Claus. 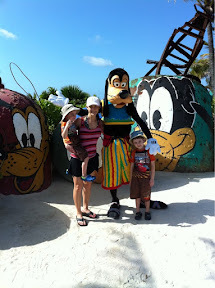 We have not had a picture of Carter NOT screaming or asleep with a character since he saw Goofy when he was almost one. It's been kind of hard because my oldest loves the characters more than anything but when Carter would go near all hell breaks loose. 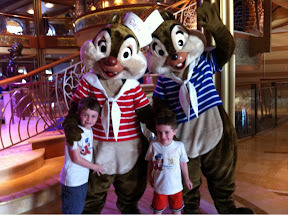 Something happened though on our most recent trip on The Disney Dream cruise ship and I don't have any idea what changed. 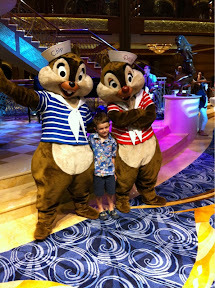 Perhaps it was a visit to Oz, but our little psycho, character-non-liking son actually posed with some of them, looking forward in fact to giving them a high five. The little man had developed some courage. This turn of events is HUGE! 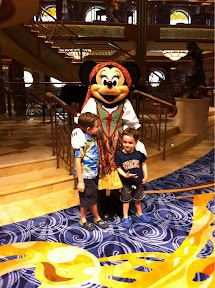 We are a Disney loving family but waiting to see the characters has always been a big problem. 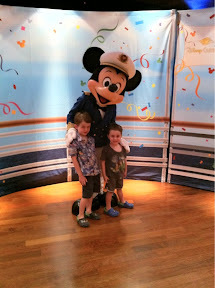 While the oldest boy always looked forward to meeting his favorites, namely Mickey and Goofy, the wait would always be too much to bear with our youngest. What are parents to do in that situation other than split up and take one to see the characters and the other to go see where people made doody. A side note on family trips to Europe Carter was always fascinated where people made number two in castles, I know pretty sick right? Anyway, my wife never got to see half the photos of Tyler with the characters as she was always with Carter somewhere, until now. Knowing how Carter is however this might not last as you never know what life with him will be like tomorrow. At least for now though we can enjoy a trip to Disney and not have to worry that Mickey might get his giant stuffed head ripped off. For one week my little man has the courage of the mightiest of lions.